Taking a cue from artists like Wavves, Das Racist, Young Rival and Skrillex, punky Portlanders the Thermals have become the latest band to release their own videogame. 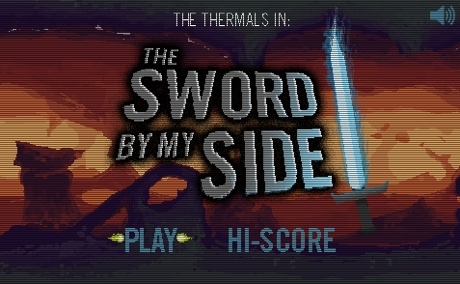 It's called The Sword by My Side and it's available to play now. The NES-style game is designed to play played on Firefox and Chrome. It features a winged character wielding a sword and killing evil-looking monsters while flying through caves. There are also a few lines of dialogue, which reveal a mythology involving sprites and wizards. Naturally, the Thermals work their way into the storyline too, and they emerge right at the end of the brief game. The game is soundtracked, appropriately enough, by the song "The Sword by My Side" from this year's Desperate Ground album. It's fairly simple stuff — there are only a couple of controls, and if you just keep pressing the spacebar (to wave the sword) you'll be just fine. Go here to play, and try to earn yourself a spot on the high scores board.